Pins of War recently sat down with Emiliano M. from Maki Games and talked about terrain and Kickstarters and all that fun kind of stuff. 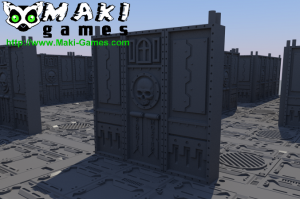 Emiliano Mancini, one of the creatives behind Maki Games, talks about Hard Plastic Modular Wargames Scenery, his company Maki Games and about the perks of living in a multi-cultural city like Amsterdam! There is also a little preview of concept sketches for Maki Games second Hi-Tech Theme.